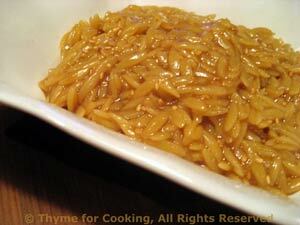 Savory Orzo, Asian style, a simple side dish from Thyme for Cooking. This is so easy to make, put everything in the pan and cook, yet the flavors are complex and pair well with roasted salmon or chicken with an Asian flavor. Put orzo, brown sugar, soy sauce and stock in a small pan and bring to a simmer on medium heat. Turn heat to low and simmer until done, stirring occasionally, 15 - 20 minutes. All stock will be absorbed. Stir in sesame oil and seeds and serve.